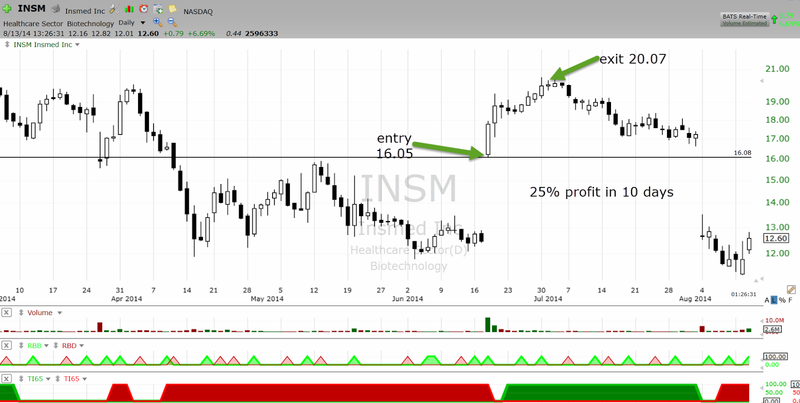 INSM is a good example of how the swing moves in market happen. On June 18th it had a gap open due to news about drug trial. That was the entry point. In 10 days the stock went up 25% before losing momentum and subsequently went down. 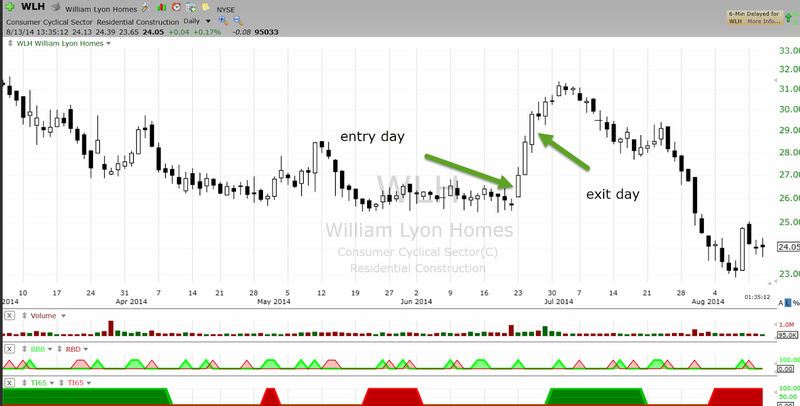 These kind of momentum burst moves of 3 to 10 days are common in the stock market. If you understand the nature of these kind of moves and develop process to find these kind of moves you can find lots of these kind of moves in a year. 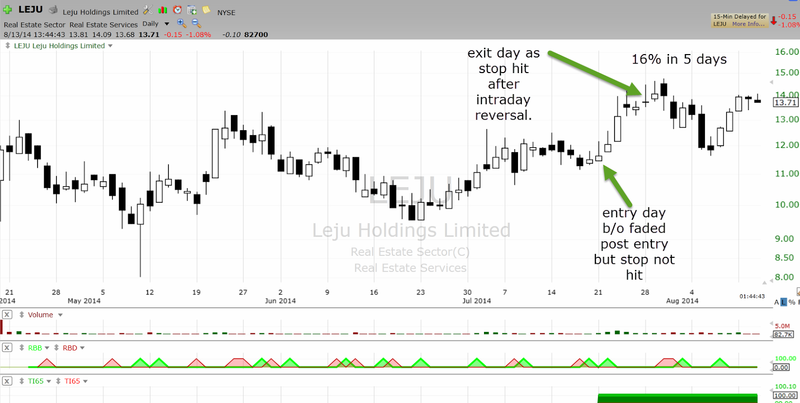 In this kind of momentum burst move in a stock , the first day is range expansion which is immediately followed by follow through. That is the bullish sequence. Variation can be 5 day burst. In rare cases you will get a 8 to 10 day burst. Sometime it will be variation of the 3 days with inside day or negative day after first day of range expansion. WLH is example of the above described sequence. A range expansion day was followed by 7 days of momentum burst followed by loss of momentum and reversal. During this 3 to 10 days period stock would go up 8 to 40% , lower priced stock and low float stocks can have big bursts in few days. Such bursts moves may or may not have clear identifiable catalyst. You need to know nothing about the company to trade this kind of burst. This is a pattern and probability based trade. It is largely mechanical way to trade for 5 to 20% profit potential moves. All such momentum bursts start with a range expansion. The first day of the move is range expansion day. Often there is also volume expansion along with range expansion. If you scan for range expansion everyday you can find such moves. Not every setup works perfectly. sometime you see range expansion in the early morning and you enter based on that but stock gives up the gain during the move. LEJU trade is an example of that kind of a action. yet the trade was profitable. When there is range expansion early in the morning or during the day it attracts breakout swing traders like me and many others who scan for these kind of moves, it attracts other momentum players, day traders, quants and so on. That results in continuation of move for few days. If you keep holding after the 3 to 10 days period, you would often see the stock ends up giving up all the burst gains and may not have another momentum burst for several weeks or months. Once you understand this nature of swing moves you can find many such moves .For a mere 3 to 5 day exposure to market you capture the most explosive part of the move and you are not seating in dead periods holding stock waiting or anticipating a breakout which may or may not come. Trading this kind of setup requires extremely good ability to ruthlessly cut losses if a trade does not work immediately .It also requires skill to exit when things are still in explosive phase and not wait for reversal. It requires skill to identify right setup. All those skills are relatively easy to learn for motivated trader. Per trade profit on these kind of trades will be on an average just 5 to 20% as you are only going to get part of the 8 to 40% move. By the time you enter on breakout day the stock might be up 4 to 10% , so you will not be able to capture that part of the range expansion move. To trade this kind of setup you need to be willing to do 200 to 1000 or more trades in a year. You make money by compounding these small gains. If you are motivated to make profit swing trading learn and master the momentum burst kind of swing trading, it allows you to grow your account with very low risk. Nice post.If on 2nd day after the range expansion day(i.e day after the b/o day)...there's correction say -2% to -3% etc should we hold on till next day ..or completion of momentum burst move or should we exit immediately? ..
As long as stop holds I hold.